Baltimore is littered with fantastic foodie sanctuaries. Nonetheless, since moving to the city from the Washington DC area I woefully noticed an absence of ethnic cuisine on every street corner. There is no denying that the ethnic boroughs in Baltimore (like Greek town and little Italy) are quite successful at what they do, but what happened to my favorite Thai restaurant nestled right next to the Pho mistress who was right behind the coolest tapas place in town? Woe is me! A lazy foodie like me needs a quick fix. An evolution of my epicure brain became an urgent requirement in order to survive in Baltimore. I quickly adapted by replicating my favorite spicy grub with store bought ingredients. Every Thai food paramour knows the coconut curries are dangerously delightful but a little too heavy for everyday consumption. 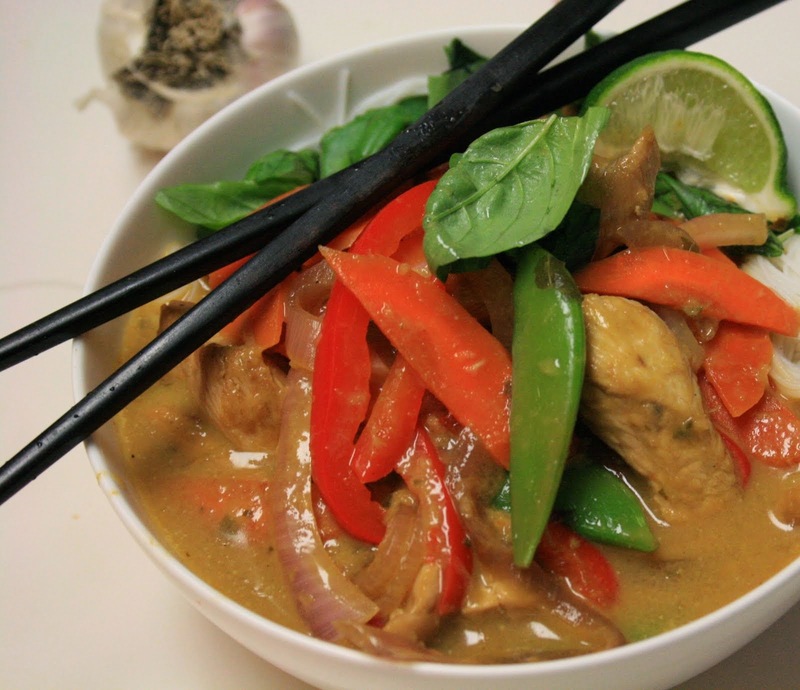 This recipe lightens up the traditional Thai green curry and utilizes ingredients that can be found at the local super market (granted your store is “with the times” and has an ethic food aisle). NOTE: Slice, grate and dice all of the ingredients beforehand. You will need to act quickly once the food hits the screaming hot wok. Pat chicken breasts dry and slice lengthwise into half inch thick pieces. Thinly slice the bell pepper, onion and carrot to roughly the same size. Sugar snap peas can be left whole. In a separate bowl, grate the ginger and garlic and whisk in coconut milk, green curry paste, 1 tablespoon soy sauce and fish sauce. Set aside. Place a wok (or large nonstick skillet) over medium-high heat until hot. Add the oil and tilt the wok to coat evenly. Add the chicken, red pepper flakes and ½ TB of soy sauce. Cook for about 3 minutes, stirring constantly. Once the chicken is almost cooked through, remove and set aside. Increase the wok to high heat. Add the sliced vegetables and cook for 1-2 minutes, stirring constantly. Add the chicken back to the party and cook for 1 minute. Pour the sauce in to the wok and let it come to a boil. As soon as the sauce comes to a boil take the wok off the heat. Top the dish with hand shredded fresh basil and a squeeze of lime.